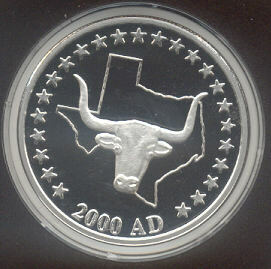 Texas Mint (based in Whitney, Texas): According to Rick Pinner, an artist and rancher, “I had this idea in 1997 that Texas needed a commemorative dollar for the Millennium and finally formalized that with my design for the 2000 issue. I spent a couple of years selling just that one, after I had them made (1998-2000). I've always had some interest in coins, but never knew much about it. After my first silver dollar sold so well (I even had some minted in .999 gold) I thought the next year I'd do a 2001, and so it continued.” As a tribute to Texas' entry into the new century, there is a silver dollar for each year since then, so minting these pieces has turned into an annual tradition. They have received lots of interest over the years and each coin “depicts someone or something from our great Texas Heritage.” Mr. Pinner had a little cabin in downtown Whitney from which they were sold, but the Texas Mint & Mercantile has since moved to a larger store. Their website and store are no longer producing and selling coins since 2007. According to Rick Pinner, "In Texas everything is larger. The Texas dime is no exception. Larger than the U.S. dime, our .22 of an ounce .999 silver dime. The dragonfly, a creature of myth and legend, is an amazing lace winged insect. Able to dart about and hover in place, its antics have been observed by many ancient peoples. Almost fairy-like, I have placed it on our Texas dime in honor of a dragonfly woman, my wife of 29 years." It was made in 2003 (actually undated). The other coin displayed is one troy ounce .999 silver Texas one Dollar featuring Texas star, bull with Texas map. I purchased these coins from Oded Paz. Further more to this Erik V. McCrea investigated some more pieces minted by various source on this subject and states: "As a companion-piece to the Republican and Texas Mint coinage, I obtained (on eBay) an interesting 1980 Texas Dollar. It was produced by the Papel Mint, Inc., and belongs to their “State Dollar Commemorative Series”, in which a unique “limited collector's edition” was minted for each of the 50 states. And, as a comrade-piece to accompany the companion-piece, I found an additional Texas Dollar on eBay. This one is undated, and features a mockingbird (state avis) and the bluebonnet (state flower) on the reverse. Apart from the tiny “© WNW”, which is present on both sides, I've no clue as to who issued the token. 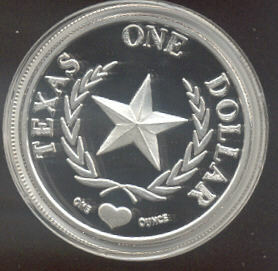 Furthermore, I came across (also on eBay) a silver “One Texas Dollar” issued by the Don Casey Company, Inc."